A data communications system (Fig. 1) in which variable length messages (Figs. 3, 4 and 5) are communicated between a general communications controller (GCC 104) and a plurality of portable and mobile radios (130, 132, 134, 136, 138). The variable length messages (Fig. 3) include a bit synchronization field (204), a message synchronization field (205) and a plurality of channel data blocks (203) for efficiently and reliably handling long strings of data or text. Each channel data block (Fig. 5) includes an information field (503), a parity field (505) for error-connecting the information field and a channel state field (507) indicating whether or not the radio channel is busy or free. The GCC (104) is coupled to a cellular arrangement of channel communications modules (CCM's 106, 108, 110, 112), which each include a radio transmitter (114, 120, 124) and/or radio receiver (116, 118, 122, 126, 128). The mobile and portable radios (130, 132, 134, 136, 138) communicate with the GCC (104) by way of the CCM's (106, 108, 110, 112). The present invention relates generally to radio communications systems, and more particularly to an improved method for coding and communicating variable length messages between a primary station and remote stations of a data communications system. A prior art data communications system for communicating messages via a radio channel between a primary station and a plurality of remote stations, as described in US patent no. 4,156,867, uses a signalling system including a variable length message which is transmitted between an originating station and received by at least one destination station, the variable length message including a bit synchronisation field, a message synchronisation field, and a plurality of data blocks. Such messages communicated from the originating station to destination stations include a start code followed by one or more data blocks each including a parity word and a number of digital words with a data and parity portions. However, no information is provided in the first or second block as to the number of following blocks, and no provision is made for efficiently and reliably accommodating long strings of data. The bits of the data block are interleaved so as to be more tolerant of burst errors. However, the interleaving scheme of this prior art data communications system typically renders blocks susceptible to the loss of either a group of data bits or a group of parity bits due to burst errors. Furthermore, simultaneous transmissions from two or more mobile stations can interfere with one another such that neither is adequately received by the central station. It is an object of the present invention to provide an improved method for coding messages communicated between a primary station and remote stations of a data communications system. It is another object of the present invention to provide an improved method for communicating variable length messages between a primary station and remote stations of a data communications system. Accordingly, the invention provides a method of coding data blocks in a signalling system for communicating messages via a radio channel between a primary station and a plurality of remote stations as defined in claim 1. According to one arrangement of data blocks, the first and second data blocks include an information field including control data and a check word, and a parity field coded from the information field according to a predetermined code, the bits of the fields being interleaved such that consecutive bits of a field are separated by a predetermined number of bits; and the third and following data blocks include an information field including data, and a parity field coded from the information field, the bits of the fields being interleaved such that consecutive bits of a field are separated by a predetermined number of bits and the information field of the last data block further includes a check word coded from the data in the information field of the third and following channel data blocks. According to another arrangement of data blocks, the first channel data block includes an information field including at least one command and a station address, and a parity field coded from the infor.mation field according to a predetermined code. The second channel data block includes an information field including a block count indicating the number of following channel data blocks, a message sequence number incremented for each message and a check word, and a parity field coded from the information field according to a predetermined code. The third and following channel data blocks include an information field including data, and a parity field coded from the information field. The bits of the fields in each channel data block are interleaved such that consecutive bits of a field are separated by a predetrmined number of bits. Figure 13 is a block diagram of the circuitry in the portable radios in Figure 1. Figures 14A and 14B taken together are a flow chart used by the channel communications modules and portable and mobile radios in Figure 1 for building, coding and transmitting messages to another station. Figures 15A and 15B taken together are a flow chart used by the channel communications modules and portable and mobile stations in Figure 1 for receiving and decoding messages from another station. Figure 16 is a diagram of the structure of variable length messages. Figure 17 is a diagram of the structure of the contents of the variable length message control register. In Figure 1, there is illustrated a data communications system that communicates message signals between a primary station, such as a general communications controller (GCC) 104, by way of a communications medium, such as a radio frequency (RF) communications channel, to a plurality of remote stations, such as portable radios 130,132 and 134 and mobile radios 136 and 138. Although described in the context of a data only communications system, both data signals and analog signals such as voice signals can be communicated over the RF communications channel to the portable and mobile radios 130, 132, 134,136 and 138. The data communications system covers a large geographical area which is divided into a plurality of cells or zones. Located throughout the geographical area are a number of channel communications modules (CCM) 106, 108, 110 and 112, which are each coupled to and control a number of RF signal transmitters 114, 120, and 124 and RF signal receivers 116, 118, 122, 124 and 128. The RF communications channel is preferably comprised of first and second carrier signals which may be modulated with the message signals. Transmitters 114,120 and 124 may be operative on the first carrier signal, while receivers 116,118,122,126 and 128 may be operative on the second carrier signal of the radio communications channel. Each zone of the radio communications system is covered by an assigned one of the transmitters 114, 120 and 124 and by at least one of the receivers 116, 118, 122, 126 and 128. Transmitters 114, 120 and 124 and receivers 116, 118, 122, 126 and 128 may be any suitable commercially available transmitters and receivers such as those described in Motorola Instruction Manual 68P81013E65, CCM's 106, 108, 110 and 112 may be co-located with their corresponding transmitters and receivers or may be remotely located located and coupled to their corresponding transmitters and receivers by means of a suitable remote control system, such as, for example, the tone remote control system described in U.S. Patent Number 3,577,080. Portable radios 130,132 and 134 may be either commercially available mobile radios of the type shown and described in Motorola instruction manual no. 68P81039E25 or commercially available hand-held portable radios of the type shown and described in U.S. patent numbers 3,906,166 and 3,962,553 and in U.S. patent no. 4,486,624, entitled "Microprocessor Controlled Radiotelephone Transceiver", filed September 15, 1980 and invented by Larry C. Puhl et al. Mobile radios may be commercially available radios of the type shown and described in Motorola instruction manual no. 68P81039E25. Portable and mobile radios 130, 132, 134, 136 and 138 each include a transmitter operable on the second carrier signal and a receiver operable on the first carrier signal. The transmitter and receiver in portable and mobile radios 130,132,134,136 and 138 may be any suitable commercially available conventional transmitter and receiver, such as, for example, the transmitter and receiver described in Motorola instruction manual no's. 68P81039E25 and 68P810014C65. These and the other Motorola Instruction Manuals referenced herein are available from the Service Publications Department of Motorola, Inc., 1301 East Algonquin Road, Schaumburg, Illinois or from Motorola C & E Parts, 1313 East Algonquin Road, Schaumburg, Illinois. GCC 104 of the data communications system in Figure 1 may be coupled to a host computer 102 which may control a number of GCC's 104 that are located in different geographical areas, such as, for example, different cities. Thus, host computer 102 may gather data from, and dispatch data to, portable and mobile radios located in several different cities. GCC104 may be coupled to host computer 102 and CCM's 106,108, 110, and 112 by means of commercially available modems and associated dedicated telephone lines. GCC 104 in Figure 1 transmits message signals to and receives message signals from portable and mobile radios 130,132,134,136 and 138 by way of CCM's 106, 108, 110 and 112. The message signals may include a binary preamble, a predetermined synchronization word, an information word containing a command, status or data, and one or more data words. As shown in Figures 1 and 2, data messages between GCC 104 and portable and mobile radius 130, 132, 134, 136 and 138 are structured as a stream of binary information (i.e., bits). The preferred embodiment of the signalling system utilizes digital frequency modulation at 4800 bits per second. This data transmission stream 200 in Figure 2 can contain one or more physical messages 203, 204. A physical message 203 or 204 within the data transmission stream 200 is preceded by a preamble 201 or 202. The preamble 201 or 202 is required to establish bit and message synchronization between the transmitting and receiving ends of the link. The preamble 201 or 202 assumes different forms depending on its position in the data transmission stream 200. The initial preamble 201, which occurs once at the beginning of a data transmission stream, contains one of two fields; bit sync field 204 and message sync field 205. The bit sync field 204 is a predefined pattern of at least twenty bits of alternating 1's and 0's, ending in a zero. Bit sync is used only at the beginning of a data transmission stream. The message sync field 205 consists of a pattern of 40 bits that mark the beginning of a physical message. Each physical message in a data transmission stream is preceded by a message sync field 205. The message sync field 205 precedes all physical messages in the data transmission stream. The preferred bit pattern of the message sync field 205 is shown in Figure 3. A physical message 401 (refer to Figure 4) is composed of one or more channel data blocks (CDB's) 403, 405, 407. The channel data block is the fundamental envelope for all information that is sent through the "ether", and is a fixed number of bits (112 bits) that is the final result of the encoding process described below. Ignoring the exact order of occurrence of the bits, a channel data block can be logically segmented into three component fields as shown in Figure 5. These fields are: a 48-bit Basic Information Unit (BIU) field 503, a 56-bit Parity Field 505, and an 8-bit channel state field 507. The basic information unit (BIU) field 503 carries the actual control and user information. There are two formats the basic information unit field 503 can assume which are developed in detail later. The parity bits are inverted prior to transmission. The implementation of this code is discussed in "An Introduction to Error Correcting Codes", by Shu Lin (Prentice Hall, 1970). In this code, the last 2 parity bits and last 8 data bits will always be zero. Eight of these bits are used to convey the channel state information by changing their sense prior to transmission. These bits logically belong to the channel state field 507. The channel state field 507 contains eight bits, seven of which are used to indicate the state of the inbound channel (inbound with respect to CCM's) to terminals that have potential inbound traffic, so that these terminals will inhibit transmission until the inbound channel is free, thus preventing message collisions. There are two states, busy and idle or free. A binary one indicates a busy state, and a binary zero indicates a free state. In other words, if the channel is busy, all bits of the channel state field 507 are set to a binary one state, and vice versa. In the case of portable and mobile radios, the channel state field 507 may be used to indicate predetermined status of the radio, such as, for example an idle or in-use condition or an emergency or normal condition. The next step in the encoding process is the interleaving. Referring to Figure 6, as the channel data block is encoded, the bits are stored in columns of a matrix. Each column holds 7 bits. The entire 112 bit channel data block fills up exactly 7 rows and 16 columns. The matrix is filled such that every other bit is from parity field 505, i.e. bits 0, 2, 4, 6, 8, 10, etc. are from parity field 505. When the matrix is filled, the bits are removed for transmission row by row. The sequence of bit numbers transmitted is 111, 104, 97, ........ 7, 0. Matrix bit #111 is sent first. Bit numbers in parentheses designate channel state bit locations in the matrix. The locations are bit numbers 1, 3, 5, 7, 9, 11 and 13. At the receiver, the bits are stored in rows of a matrix. Each row holds 16 bits and the entire 112 bits fills up exactly 7 rows. When the matrix is filled, the bits are removed (for decoding) column by column. This exactly complements the interleaving process of the encoder. The channel data block decoder takes in the 112 bits and, if possible, extracts an exact copy of the Basic Information Unit and channel state bits that were transmitted. As the bits are removed from the de-interleaving matrix, channel errors are corrected according to the decoding process for such codes, as will be known so one versed in the art, and as explained in the reference mentioned above. The Type-1 basic information unit is shown in Figure 7. This form is used primarily to communicate control information (i.e., terminal address, message control parameters, etc.). The first channel data block of a physical message is always of Type-1. To properly perform control functions, error detection is required to prevent any uncorrected bit errors from inadvertently causing an undesired control function. This error protection is provided by dividing the 48-bit type 1 basic information unit into two fields: a 32-bit command field 702 and a 16-bit cyclic redundency check (CRC) field 703. The cyclic redundency check field 703 is computed from the command field 702 prior to transmission and laser checked upon reception. Integer quotient digits are ignored and the CRC field 703 is filled with the complement of the resulting remainder value. The remainder is complemented (1's complement) to provide protection against bit sync loss. Upon message reception, the same process is followed. The result is compared with the received CRC and if they exactly match, the message is acceptable. The type-2 basic information unit in Figure 8 is used primarily to communicate user data (e.g., text) and error checks on user data. The format and coding of the type-1 basic information unit in Figure 5 is described in detail in U.S. patent no. 4,590,473, entitled "Data Signalling System", filed July 28, 1982 and invented by Timothy M. Burke, et. al, and in the instant assignee's U.S patent no. 4,517,669, entitled "Method and Apparatus for Coding Messages Communicated Between A Primary Station and Remote Stations of a Data Communications System", invented by Thomas A. Freeburg and Jay Krebs, and filed the same day as the instant application. As explained in aforementioned U.S. patent no. 4,590,473, the type-1 basic information unit provides for instruction blocks or register blocks. Instruction blocks contain identifier (3 bits), op-code (5 bits), argument (8 bits) fields. The instruction blocks manipulate the contents of registers in the portable and mobile radios (see registers in RAM 626 of microcomputer 520 in Figure 13). 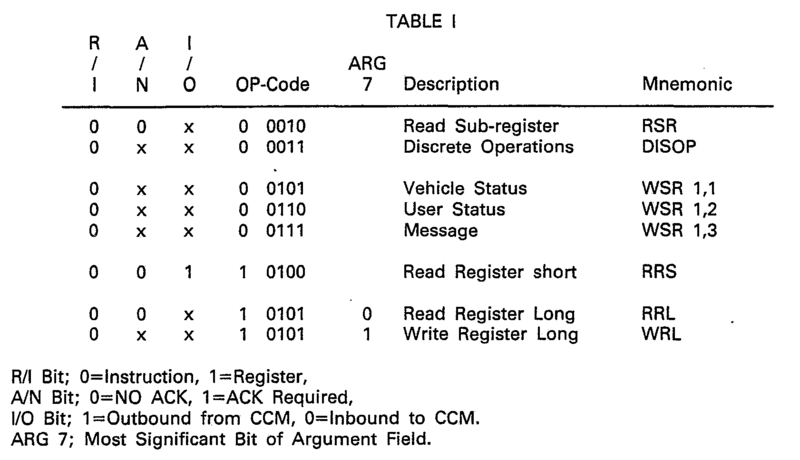 The various instruction blocks and their coding are summarized hereinbelow in Table I. A variable length physical message can be constructed by transmitting a varable number of channel data blocks continuously. Variable length data (e.g., text, transparent binary information, etc.) is divided (blocked) into an integral number of segments such that each segment fills a channel data block. The channel data blocks are transmitted, along with appropriate control information, and are de-blocked to recover the original form of the data upon reception. Referring to Figure 16, variable length physical message 203 is preceded by preamble 201, and consists of channel data block 207, which is build from a type-1 basic information unit, and contains addressing and command information, channel data block 209, which is also built form a type-1 basic information unit, and contains further control information to be described below; a number of channel data blocks 211, each built from a type-2 basic information unit and containing up to 48 bits of the user data to be transmitted, and terminated by channel data block 213, which is built from a type-2 basic information unit, and contains up to 32 bits of the user data in addition to a 16 bit cyclic redundancy check character. Since the Type-2 basic information unit format is used for the user data and its definition contains no facility to detect errors that may escape error correction, the message level CRC is defined. This CRC uses the same algorithm that is defined for use in the type-1 basic information unit, and is computed over all of the user data. Referring to Figure 17, a variable length message control register (VLMCR) is loaded with the contents of the second channel data block in the variable length message. The VLMCR then instructs the terminal with format and control information that directs the processing of the message. The block count field 241 specifies the size of the variable length message. This field provides the terminal with information to perform buffer management and enables the base end controllers to assess the size of inbound variable length messages. The message format 243 field specifies the format and padding of the user data. The format field is divided into two sub-fields; the information coding sub-field (ICSF) and the information padding sub-field (IPSF). The ICSF specifies one of four possible ways in which the information portion of the message may be coded, e.g. ASCII, binary data, etc. The IPSF specifies the amount of padding that is required to make the message an integer number of blocks. The physical message sequence number field (PMSNF) 247 is divided into two sub-fields; a 1-bit re-synchronization sequence flag (RSF), and a 3-bit physical message sequence number (PMSN). The physical message sequence number provides the terminal and base ends of the R/F network with the capability to reject duplicate copies of the same message. The duplicate copies can result when ACKs are lost and the message is re-transmitted. The capability to re-sync the PMSN is also defined when RSF= 1. The PMSN is incremented by the sender when an acknowledgement is received to the transmission. A transmission procedure is initiated with the first transmission of a physical message. Subsequent re-transmission of the same physical message, in an attempt to set an acknowledgement, are part of the same transmission procedure and use the same PMSN. That is, repeat transmissions of non-acknowledged physical messages will not cause the number to be incremented. The sequence number, both inbound and outbound, can assume incrementing values modulo-7, including zero (0). Thus, a continuous sequence of physical messages to the same destination will have an incrementing sequence number (...0, 1, 2,...5, 6, 7, 0,...). The receiver will only accept messages that have a monotonically increasing sequence number (modulo-7) that is one greater than the last one it received. The receiver will send a negative acknowledgement, indicating to the sender that the message is out of physical sequence. The PMSN is re-sync'ed with a physical message that has the RSF set. The re-sync sequence flags (RSF=0) indicates the PMSN is to be checked as described above. When (RSF=1 ) the PMSN check will not be made and the physical message will be accepted by the receiver (and ACK'ed if specified). Additionally, the receiver's current PMSN will be updated to that of the PMSN of the physical message it rode in on. The logical message sequence number field 249 in Figure 17 provides the capability to manage the communication of large logical messages by segmenting the logical message into several physical messages. It also supports the capability to interrupt the transmission of a long logical message, composed of many physical message segments, with the transmission of a single segment logical message. This interruption must occur between physical segment transmission. The LMSNF is further divided into two sub-fields; logical message sequence number (LMSN), and last segment flag (LSF). The LSF indicates that the associated message segment is the last segment in the logical message (LSF=1) or it is not the last segment (LSF=0). The LMSN sequentially numbers and identifies physical message segments within a logical message. In a multi-segment message, the LMSN is initalized to zero (0) upon the transmission of the first physical message segment. The LMSN is incremented with each succeeding message segment and wraps around to the value of one (1) (e.g., 0, 1, 2,...7, 1, 2,...). Note that zero (0) has been left out of all but the start of the sequence. This permits a single transmission logical message (OIC) to interrupt and resume multi-transmission (multiple physical messages from one logical message) logical message. If the LMSN is found to be out of sequence upon reception, the logical message may be aborted and restarted from the beginning. If the logical message consists of several physical message segments, the first physical message in the chain will be identified by: LSF=0 and LMSN=0. The physical messages that are in the middle (i.e., not the first nor the last physical messages) and identified by: LSF=O and (1<=LMSN <=7). Note that the LMSN is allowed to wrap from 7 back to 1. This message may be interrupted by a physical message marked by (OIC) and resumed with the next sequential physical message of the logical message chain. If the logical message consists of several physical message segments, the last physical message will be identified by: LSF=1 and (1<=LMSN<=7). The user header offset field 253 in Figure 17 defines the size of the user header information that may precede the displayable portion of the character oriented message. Essentially, the variable length portion of the message is divided into two parts; user header and user data. The user header contains variable length user supplied information (i.e. transaction I.D., program function key, data presentation parameters etc.) that is not displayed, but is passed to user applications programs as a set of parameters. The user data portion is the part of the message that is displayable. Since the user header is variable length, and in fact optional, it can change in structure and content depending on the message. Also, changes to the user header will not impact the system software of the terminal or base since its contents are transparent to that software. The message priority field 251 provides the terminal with the capability to process messages at four (4) different priority levels. Referring back to Figure 1, message signals are routed by GCC 104 to a selected CCM 106,108,110 and 112 for transmission by its corresponding transmitter. Since the message signals are not transmitted on all transmitters simultaneously, as in simulcast systems of the type described in U.S. Patent Number 4,188,522, it is necessary that GCC 104 have a reasonably accurate determination of the location of each portable radio 130,132 and 134 so that GCC 104 may select the transmitter 114,120 or 124 which covers the zone in which a particular portable radio is located. Utilizing unique processes, the GCC 104 dynamically selects the transmitter 114, 120 or 124 for transmitting a message signal to a selected portable or module radio 130, 132, 134, 136 or 138. According to another unique feature of the data communications system in Figure 1, two or more of the transmitters 114,120 or 124 can be operated simultaneously for communicating with different portable radios located in different zones provided that transmissions from the two transmitters do not interfere with reception in the particular zones where the two portable radios are located. As a result, data throughput of the data communications system illustrated in Figure 1 can be significantly increased by re-use of the RF communications channel. In other words, by taking advantage of re-use, a single RF communications channel can serve thousands of portable and mobile radios in a geographical area covering several states and their major cities. Then, using the ZADJ matrix, GCC 104 can select the zone which has the largest adjusted signal strength for a particular transmission from a portable or mobile radio. The selected zone can be stored together with other data in a location of the memory of GCC 104 associated with that portable radio. Whenever transmitting a message signal to that particular portable or mobile radio, GCC 104 will first transmit the message signal on the carrier signal of the transmitter that covers the zone which had the largest adjusted signal strength for the last transmission from that portable or mobile radio. Both that zone and the transmitter covering it are stored in the memory of GCC 104. If the portable or mobile radio does not acknowledge the transmission of the message signal from GCC 104, GCC 104 may attempt one or more retransmissions of the message signal by means of that selected transmitter. If the retransmissions likewise are not acknowledged by the portable or mobile radio, GCC 104 may then transmit the message signal via the transmitter covering the zone which had the second largest adjusted signal strength for the last transmission from that portable or mobile radio. Again, if the portable radio does not acknowledge the transmission from GCC 104, GCC 104 may resend the message signal one or more times by means of that selected transmitter. If GCC 104 does not reach the selected portable or mobile radio by means of these two transmitters, GCC 104 may either select another transmitter covering that portable or mobile radios "home" zone, or initiate a polling sequence in which the selected portable or mobile radio is polled in every zone in the data communications system starting with the portable or mobile radio's "home" zone. The transmitter re-use features of the novel data communications system in Figure 1 are described in further detail in the instant assignee's co-pending U.S. patent no. 4,481,670, entitled "Method and Apparatus for Dynamically Selecting Transmitters for Communications Between a Primary Station and Remote Stations of a Data Communications System", filed November 12,1982, and invented by Thomas A. Freeburg. Referring to Figure 10, there is illustrated a detailed circuit diagram of the receivers 116, 118, 122, 126 and 128 associated with CCM's 106, 108, 110 and 112 in Figure 1. Each receiver includes two antennas spaced at a predetermined distance from one another and a maximal ratio predetection diversity combiner 312, 314, 316, 318, 320, 322, 324, 326 and 328 for combining the signals received by each of the antennas. The space diversity provided by the two antennas is utilized to prevent degradation in communications which results when an antenna is located in an RF signal null. Rapid and deep RF signal nulls, called Rayleigh fading, are experienced in communications systems operating at RF signal frequencies in the new 800 to 900 mHz frequency range. The maximal ratio predetection diversity combiner cophases the RF signals from each antenna and linearly adds the cophased signals to provide a composite signal having components that are proportional to the square of the RF signals from each antenna. Therefore, strong signals are emphasized much more than weak signals. In other words, communications are not adversely affected if a very weak signal is received by one antenna and a reasonably good signal is received by the other antenna. In the diversity receiver in Figure 10, the frequency of local oscillator 306 determines the radio channel to which the diversity receiver is tuned. The RF signal received by each antenna is combined by mixers 302 and 304 with the sinal from local oscillator 208 to provide corresponding IF signals. The IF signal from mixers 302 and 304 is than applied to IF bandpass filters 308 and 310, respectively, which may be a monolithic bandpass filter of conventional design similar to that described in U.S. patent no. 3,716,808. The filtered IF signals from filters 308 and 310 are split and fed forward via two paths to mixers 312, 324 and 314, 326, respectively. First portions of the IF signals are applied to mixers 324 and 326, and second portions of the IF signals are applied to mixers 312 and 314 together with the composite IF signal which is fed back from amplifier 330. By feeding back the composite IF signal, the IF strip of the diversity receiver forms a closed feedback loop that is regenerative on noise. Thus, the randomly varying phase of the IF signals from filters 308 and 310 relative to the composite IF signal is added into the closed loop via mixers 312 and 314 and then subtracted out at mixers 324 and 326, respectively. By this process, the random phase variations are removed from the IF signals in relation to the composite IF signal. The result is that each of the IF signals is cophased to the composite IF signal. The product signals from mixers 312 and 314 at the difference frequency are applied to filters 316 and 318, respectively, which each provide a variable phase shift. Filters 316 and 318 may be two-pole crystal filters. The signals from filters 316 and 318 are linearly amplified by amplifiers 320 and 322, respectively and applied to the second input of mixers 324 and 326, respectively. Mixers 324 and 326 multiply the signals from amplifiers 320 and 322, respectively, with the IF signals from filters 328 and 310, respectively, to provide product signals that are cophased with the composite IF signal. The product signals from mixers 324 and 326 are both cophased and proportional to the square of the level of the IF signals from filters 328 and 310, respectively. The product signals from the mixers 324 and 326 are linearly added by summer 328 to form one composite IF signal. The composite IF signal may be coupled via amplifier 330 to a conventional FM detector 332 which has an output signal providing demodulated message signals. The output signal of FM detector 332 is coupled to its corresponding CCM 106, 108, 110 or 112 in Figure 1. Further details of the circuitry in the diversity receiver in Figure 10 are illustrated and described in the instant assignee's co-pending U.S. patent no. 4,369,520, filed on March 22,1979, entitled "Instantaneously Acquiring Sector Antenna System", and invented by Frank J. Cerny, Jr. and James J. Mikulski, and in U.S. patent no. 4,519,096 filed on June 1, 1981, entitled "Large Dynamic Range Multiplier for a Maximal Ratio Diversity Combiner", and invented by Frank J. Cerny, Jr. Figure 10 also illustrates the circuitry 340, 348 and 350 comprising the signal strength detector that is located in the receivers. Summer 340-346 is coupled to the signals from filters 308 and 310 and provides a composite signal which is coupled to amplifier 348. The output of amplifier 348 is coupled to envelope detector 350 which provides an SSI signal that is proportional to the maxima of the composite signal from amplifier 348. A separate amplifier 348 and envelope detector 350 can be provided for each of the signals from filters 308 and 310 if it is desired to measure each separately. The SSI signal from envelope detector 350 is coupled to its corresponding CCM 106, 108, 110 or 112 in Figure 1, where it is digitized. Many other types of commercially available signal strength detecting circuitry can be utilized in place of summer 340-346 amplifier 348, and envelope detector 350. Referring to Figure 11, there is illustrated a block diagram of the circuitry in CCM's 106, 108, 110 and 112 in Figure 1. Each CCM includes a microcomputer 402 having a memory with stored program therein for communicating with GCC 104 and portable and mobile radios 130, 132, 134, 136 and 138 in Figure 1. Microcomputer 402 can be any suitable commercially available microcomputer such as, for example, the Motorola type MC6800, MC6801, MC6805 or MC68000 microprocessor, or those microprocessors described in U.S. patent numbers 4,030,079 and 4,266,270, and the patents and patent applications referred to therein. Microcomputer 402 is coupled to conventional RS232 interface 404 which may be coupled by a modem to a dedicated telephone line from GCC 104 in Figure 1. Message signals received by microcomputer 402 from the GCC may be assembled into variable length messages 203, 204 in Figure 2 and coupled to filter 406 and thereafter applied to its corresponding transmitter. The preferred embodiment of the transmitter utilizes digital frequency modulation at 4800 bits per second for coding message signals for transmission. A suitable modulation circuit is described in U.S. patent no. 3,414,842. Other suitable message signal coding schemes are described in the aforementioned US patent nos. 3,906,445, 4,156,867 and 4,354,252 and U.S. patent no. 4,590,473. Message signals received from portable or mobile radios by a CCM's receiver are coupled to filter 408 and thereafter to limiter 410 which converts the analog signals into a non-return-to-zero binary signal. The output of limiter 410 is applied to an input port of microcomputer 402 which decodes the information and data therein. Microcomputer 402 also takes signal strength readings while it is receiving message signals. The SSI signal from its corresponding receiver is coupled to A/D converter 412, which may continuously convert the analog SSI signal to a digitized SSI signal having eight bits. The digitized SSI signal from A/D converter 412 is applied to an input port of microcompouter 402. Several A/D conversions are performed while a message signal is being received. The digitized SSI signals for the several conversions are averaged by microcomputer 402. The average SSI signal is appended to the received message signal which is sent by microcomputer 404 via RS232 interface 404 to GCC 104 in Figure 1. The information and data in a received message signal may be coded in any suitable conventional format for transmission to GCC 104. Referring to Figure 12, there is illustrated a block diagram of the circuitry in the general communications controller 104 in Figure 1. The GCC includes a microcomputer 500 having a memory with a stored program for communicating with CCM's 106, 108, 110 and 112 in Figure 1. Microcomputer 500 is coupled to conventional RS232 interfaces 504, 505 and 506 which may be coupled by modems to dedicated telephone lines from each CCM. Microcomputer 500 is also coupled to a conventional RS232 interface 502 which may be coupled to a dedicated telephone line from host computer 102 in Figure 1. Information in message signals received from portable radios by way of CCM's 106, 108, 110 and 112 is forwarded by microcomputer 500 to host computer 102. Conversely, information to be sent to portable radios from host computer 102 is transmitted to microcomputer 500 and incorporated into message signals transmitted to designated portable radios. Microcomputer 500 receives signal strength information from each of the CCM's whenever a portable radio transmits a message signal and processes the signal strength information to determine the zone in which that portable radio is presently located. Microcomputer 500 stores for each portable radio the zone having the largest adjusted signal strength for the last transmission, the zone having the second largest adjusted signal strength for the last transmission, the "home" zone assigned to that portable radio, and the last zone used for communications with that portable radio. For subsequent transmissions of message signals to a portable radio, the GCC accesses the zone location information for that portable radio and selects a transmitter for transmitting a message signal in the zone in which the portable radio is most likely located. Microcomputer 500 also keeps track of which transmitters are in use and which transmitters interfere with communications in a particular zone. Thus, when transmitting a message signal in the zone where a selected portable radio is located, a microcomputer 500 inhibits the use of other transmitters which would interfere with communications in that zone. If transmission of a message signal on a portable radio would interfere with a transmission already under way, microcomputer 500 queues that message signal for transmission when the interfering transmitter has completed its transmission. Microcomputer 500 can be any suitable commercially available microcomputer, such as, for example, a Motorola type MC6800, MC6801, MC6805 or MC68000 microprocessor, or those microprocessors described in U.S. patent numbers 4,030,079 and 4,266,270 and the patents and patent applications referred to therein. Referring to Figure 13, there is illustrated a block diagram of the circuitry in portable and mobile radios 130, 132, 134, 136 and 138 in Figure 1. Each portable or mobile radio includes a radio transceiver 640, microcomputers 620 and 660, an alphanumeric display 610, and a keyboard 612. Alphanumeric display 610 may be any commercially available display, such as an LCD display or gas discharge display, that provides for the display of one or more lines of alphanumeric information. Display 610 is controlled by I/O device 621 of microcomputer 620. Keyboard 612 may be any commercially available keyboard having both numeric and alphanumeric keys. Keyboard 612 is coupled to I/O device 621 of microcomputer 620, which senses activation of its various keys. Radio transceiver 640 in Figure 13 may be any suitable commerically available transceiver, such as that described in the aforementioned Motorola instruction manual no. 68P81039E25 and in Motorola instruction manual no. 68P81014C65. Radio transceiver 640 includes two antennas spaced at a predetermined distance from one another for providing receiver diversity. The two antennas may also be located within the radio housing as shown and described in the instant assignee's copending U.S. patent no. 4,584,709, entitled "Homotropic Antenna System", invented by Thomas F. Kneisel et al. filed on July 6,1983, and U.S. patent no. 4,584,713, entitled "Signal Quality Steered Diversity" invented by Eugene J. Bruckert et al, and filed on July 6, 1983. Receiver 641 is coupled directly to one antenna and coupled by duplexer 642 to the other antenna. Duplexer 642 may be any suitable commercially available duplexer, such as that described in U.S. patent number 3,728,731. Receiver 641 may include suitable commercially available circuits for selecting between the two antennas, such as, for example, the antenna selection circuitry in the aforementioned patent applications, U.S. patent nos. 4,584,709 and 4,584,713 and in Motorola instruction manual no. 68P81039E25. Receiver 641 demodulates message signals transmitted from the CCM transmitters. The demodulated message siganls are filtered by filter 616 and limited by limiter 614 and thereafter applied to I/O device 661 of microcomputer 660. Message signals from I/O device 661 of microcomputer 660 are applied to filter 618 and thereafter to transmitter 643 for transmission to CCM receivers. Transmitter 643 is turned on in response to the TX key signal from I/O device 661 of microcomputer 660. The output of transmitter 643 is coupled to one of the radio transceiver antennas by way of duplexer 642. Microcomputers 620 and 660 in Figure 13 each include I/O devices 621 and 661, microprocessor (MPU) 622 and 662, random-access memory (RAM) 626 and 666, and read-only memory (ROM) 623 and 663, respectively. Microcomputer 620 also includes a removable I.D. ROM 624, which contains the sixteen bit address assigned to the portable or mobile radio. MPU's 622 and 662 may be any suitable commercially available microprocessor, such as, for example, the Motorola Type MC6800, MC6801, MC6805 or MC68000 microprocessors, or those microprocessors described in U.S. patent numbers 4,030,079 and 4,266,270 and the patent applications referred to therein. Similarly, I/O device 621 and 661, RAM 626 and 666, ROM 623 and 669 and I.D. ROM 624 may be any commercially available devices that are suitable for operation with the type of microprocessor selected for MPU's 622 and 662. ROM's 623 and 663 store the control programs that are executed by MPU's 622 and 662, respectively for communicating message signals and acknowledgement signals between the portable or mobile radio and GCC 104 in Figure 1. RAM 626 includes both a scratch pad area used by MPU 622 during execution of the control program stored in ROM 623 and a number of register locations allocated for storing the address or identification code of the portable or mobile radio read in by MPU 622 from I.D. ROM 624, information displayed by display 610, information entered from keyboard 612, and other status and control information. The contents of specific registers in RAM 626 may be loaded or read-out by way of message signals received from GCC 104 in Figure 1. Microcomputer 660 in Figure 13 receives messages 203, 204 in Figure 2 by way of receiver 641 from the GCC. Microcomputer 660 demodulates, de-interleaves and decodes the information and data in each message and loads the data into shared memory 650, which includes semaphore 651 and RAM 652. Access of RAM 652 is controlled by semaphore 651, which is shown and described in further detail in the instant assignee's U.S. patent no. 4,594,657, entitled "Semaphore for Memory Shared by Two Asynchronous Microcomputers", invented by John P. Byrns, and filed on April 22,1983. Microcomputer 620 then accesses the new information and data from shared memory 650 and processes it. Information and data to be transmitted is formatted into information and data words (see Figures 2, 5 and 7) and loaded into shared memory by microcomputer 620. Microcomputer 660 reads out the information and data words from shared memory 650 and assembles the information and dat4a words into messages 203, 204 as illustrated in Figure 2 and automatically transmits the messages to the GCC. The portable radio illustrated in Figure 13 may be either a mobile radio that is installed in a vehicle or a portable radio that is small enough to be hand-carried from place to place (see the aforementioned Motorola Instruction Manual Number 68P81014C65). Although the portable or mobile radio in Figure 13 is primarily adapted to transmit and receive message signals including alphanumeric information, the radio may also provide voice communications by means of a speaker (not shown) connected to the output of receiver 641 and a microphone (not shown) connected to the input of transmitter 643. A portable radio adapted to communicate both alphanumeric information and voice signals is described in the instant assignee's U.S. patent no. 4,430,742, filed November 20, 1981, entitled. "Data Muting Method and Apparatus for Radio Communications System", and invented by Thomas A. Freeburg et al. Referring next to Figures 14A and 14B taken together, there is illustrated a flow chart including the process steps used by CCM's 106, 108, 110 and 112 and portable and mobile radios 130, 132, 134, 136 and 138 in Figure 1 for building, coding and transmitting messages to another station. The flow chart in Figures 14A and 14B provides a detailed description of the process steps for enabling microcomputer 402 in Figure 11 and microcomputer 660 in Figure 13 to transmit variable length messages. The coding of the process steps of the flow chart in Figures 14A and 14B into the instructions of a suitable commercially available microcomputer is a mere mechanical step for a routineer skilled in the art. Referring to Figure 14A, the flow chart for transmitting variable length messages is entered at block 710 where the bit synchronization pattern is transmitted first. Next, a block 712, the message synchronization pattern is transmitted. Proceeding to block 714, the commands for the type-1 BIU in the first and second channel data blocks is built. Then, at block 716, the CRC is computed for each BIU and appended thereto. The parity for each BIU is computed in block 718 using a preselected convolution code. Then, at block 720, the BIU, parity and channel state are interleaved, as illustrated and described with respect to Figure 6 hereinabove, and the first and second channel data blocks are transmitted form the originating station. At any point during the transmission of a channel data block, the binary state of the bits in the channel state field are dynamically changed to reflect predetermined status, such as, for example, whether or not the inbound channel is busy orfree, or whether or not an emergency condition exists at the originating station. Since the binary state of the bits in the channel state field are dynamically changed, the predetermined status conveyed by the channel state field can be detected by the destination station without first decoding the information in a channel data block. Referring next to Figure 14B, program control proceeds from block 722 in Figure 14A to block 724 where a check is made to see if 48 bits of data are available. If no, YES branch is taken from decision block 724 to block 730 where a type-2 BIU is built with the next 48 bits of data. Then, at block 732, the CRC is updated to reflect the present BIU. The parity is then computed for the present BIU at block 734 with the preselected convolution code. Then, at block 736, the present BIU, parity and the channel state are interleaved and the channel data block is transmitted by the originating station. Program control then proceeds back to decision block 724 to check for any remaining data bits to be transmitted. If 48 bits of data are not available, NO branch is taken from decision block 724 to decision block 726 where a check is made to determine if there are 32 or less data bits remaining. If not, NO branch is taken from decision block 726 to block 728 where null data is appended to the more than 32 data bits to create a 48 bit field. Program control proceeds from block 728 to block 732 for transmitting the newly formed 48 bits of data. If 32 or less data bits are available, YES branch is taken from decision block 726 to block 740 where the CRC is updated to reflect the present BIU. Then, at block 742, the CRC and any necessary null data is appended to the 32 or less data bits to form a 48 bits BIU. The parity is then computed for the present BIU at block 744 with the preselected convolution code. Finally, at 746, the BIU, parity and channel state are interleaved and the last channel data block is transmitted by the originating station. Referring to Figures 15A and 15B taken together, there is illustrated a flow chart used by CCM's 106, 108, 110 and 112 and portable and mobile radios 130, 132, 134, 136 and 138 in Figure 1 for receiving and decoding messages f;rom another station. The flow chart in Figures 15A and 15B provides a detailed description of the process steps for enabling microcomputer 402 in Figure 11 and microcomputer 550 in Figure 13 to receive variable length messages. The coding of the process steps of the flow chart in Figures 15A and 15B into the instruction of a suitable commercially available microcomputer is a mere mechanical step for a routineer skilled in the art. Referring to Figure 15A, the flow chart for receiving and decoding messages is enfered at decision block 820, where a check is made to determine if message sync has been received. If not, NO branch is taken and program control waits for reception of message sync. Otherwise, YES branch is taken from decision block 820 to block 822, where the next 112 data bits are buffered and the channel state bits are checked. If three or more consecutive bits of the channel state field indicate that the channel is busy, the transmission of messages by the receiving station are inhibited until three or more consecutive bits of the channel state field indicate that the channel is free. Thus, according to an important feature of applicants' signalling system, collisions between simultaneously transmitting stations can be prevented by utilizing the information in the channel state field. Next, at block 824, the buffered channel data clock is deinterleaved and decoded using the preselected convolution code. Then, at decision block 826, a calculated CRC for the received BIU is compared with the received CRC. If they are not the same, NO branch is taken to return back to decision block 820. Otherwise, YES branch is taken to decision block 828 where the received address is checked. If the received address is not valid, NO branch is taken back to decision block 820. The validity check is made by portable and mobile stations by comparing the received address with their preassigned address stored in ID ROM 624 in Figure 13. In the case of GCC, the received address is valid if it is assigned to an active mobile or portable radio in the data communication system. If the received address is valid, YES branch is taken from decision block 828 to block 830 where the next 112 data bits are buffered and the channel state field is checked. Then, at block 832, the received CDB is deinterleaved and decoded using the preselected convolution code. Program control proceeds from block 832 in Figure 15A to decision block 834 in Figure 15B, where a calculated CRC for the received BIU is checked with the received CRC. If they are not the same, NO branch is taken to return to decision block 820 in Figure 15A. Otherwise, YES branch is taken to block 836 where the control information from the second CDB is stored in an appropriate register. In the case of portable and mobile radios, a register in RAM 626 in Figure 12 is loaded with the control information. Then, at block 838, the next 112 data bits of the next CDB are buffered and the channel state is again checked. The received CDB is deinterleaved and decoded using the preselected convolution code at block 840. Then, at block 842, the data in the received CDB is stored in a buffer in the receiving station. Next, at decision block 844, a check is made to determine if the received CDB is the last CDB of a message. If not, NO branch is taken back to block 838. Otherwise, YES branch is taken to decision block 846 where a calculated CRC for the received BIU is compared to the received CRC. The last CDB of a message contains the CRC for all CDB's carrying data. If they are not the same, NO branch is taken back to decision block 820 in Figure 13A. Otherwise, YES branch is taken to block 848, where an acknowledgement message (ACK) is transmitted by the receiving station to indicate to the originating station that the message has been properly received. The transmission of the ACK message may have to be delayed depending on the state of the bits in the received channel state field. The flow charts in Figures 14 and 15 provide a detailed description of the process steps used by CCM microcomputers 402 in Figure 11 and portable and mobile microcomputers and in Figure 13 for communicating message signals between stations. The coding of the process steps of the flow charts in Figure 14 and 15 into the instructions of a suitable commercially available microcomputer is a mere mechanical step for a routineer skilled in the art. By way of analogy to an electrical circuit diagram, the flow charts in Figures 14 and 15 are equivalent to a detailed schematic for an electrical circuit where provision of the exact part values for the electrical components in the electrical schematic corresponds to provision of microcomputer instructions for blocks in the flow charts. In summary, a unique method and apparatus for coding and communicating variable length messages between stations of a data communications systems has been described. The signalling system results in messages that are more tolerant of burst errors than heretofore possible. Furthermore, the channel state, i.e. busy or free status, is dynamically communicated to all stations for minimizing message collisions. for the third and following data blocks, producing (730) an information field including data, coding (734) a parity field from the information field, and interleaving (736) the bits of the fields such that consecutive bits of a field are separated by a predetermined number of bits; and for the last data block, producing (742) an information field including data and a check word coded from the data in the information field of the third and following data blocks. 2. The. method according to claim 1, further characterized by the step of producing (720, 736, 746) for each data block a channel state field for indicating predetermined status. 3. The method according to claim 2, further characterized by the step of dynamically changing (720, 736, 746) the channel state field during transmission of the message to indicate whether the radio channel is busy or free. 4. The method according to claim 1, 2 or 3, further characterized in that, for said first data block, said information field producing step produces an information field including at least one command, a station address and a check word coded from the command and station address; and for said second data block, said information field producing step produces an information field including at least a block count, a message sequence number incremented for each message and a check word coded from the block count and message sequence number. in response to detection of the pre-assigned remote station address in the error-corrected information field of the first received data block, executing the command therein, error-correcting and storing (836,838, 840, 842) the block count of the information field of the second received data block in the register means, and error correcting and storing (838, 840, 842, 844) the contents of the information field of the following received data blocks in the memory means until a number of data blocks substantially the same in the block count in the register means have been received. 6. The method according to claim 5, further characterized by the step of transmitting (848) an acknowledgement message when all data blocks of the variable length message have been received. inhibiting (822, 830, 838) transmissions by said transmitting means when the channel state field of a received variable length message indicates that the radio channel is busy. storing (838, 840, 842, 844) the contents of the error-corrected information fields in the memory means in response to execution of the command. 9. The method according to claim 8, further characterized by the step of transmitting (848) an acknowledgement message when all data blocks of the variable length message have been received. AT84902851T AT36105T (en) 1983-07-11 1984-06-28 A method of transmitting night set of variable length between a master station and a terminal station in datenuebertragungssystem. FR2565443B1 (en) * 1984-05-29 1987-01-30 Cit Alcatel Processes of diffusion and reception of sound programs and high quality reception device. FR2657480B1 (en) * 1990-01-22 1992-04-10 Alcatel Business Systems byte transmission method using óoeuvre a synchronous frame combining asynchronous cells isochronous channels.